Greenock (/ˈɡriːnək/ ( listen); Scottish Gaelic: Grianaig, pronounced [ˈkɾʲiənɛkʲ]) is a town and administrative centre in the Inverclyde council area in Scotland and a former burgh within the historic county of Renfrewshire, located in the west central Lowlands of Scotland. It forms part of a contiguous urban area with Gourock to the west and Port Glasgow to the east. 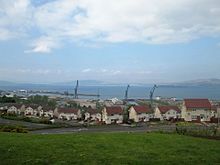 The 2011 UK Census showed that Greenock had a population of 44,248, a decrease from the 46,861 recorded in the 2001 UK Census. It lies on the south bank of the Clyde at the "Tail of the Bank" where the River Clyde expands into the Firth of Clyde. Place-name scholar William J. Watson wrote that "Greenock is well known in Gaelic as Grianáig, dative of grianág, a sunny knoll". 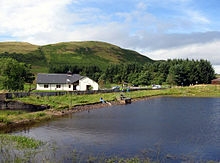 The Scottish Gaelic place-name Grianaig is relatively common, with another (Greenock) near Callander in Menteith (formerly in Perthshire) and yet another at Muirkirk in Kyle, now in East Ayrshire. Local writer R. M. Smith (1921) described the alternative derivation from Common Brittonic *Graenag, a "gravelly" or "sandy place", as more appropriate, accurately describing the original foreshore. Johnston (1934) notes that "some Gaels call the seaport Ghónait", and that a possible derivation may be greannach, meaning "rough, gravelly". The name of the town has had various spellings over time. It was printed in early Acts of Parliament as Grinok, Greenhok, Grinock, Greenhoke, Greinnock, and later as Greinok. Old Presbyterial records used Grenok, a common spelling until it was changed to Greenock around 1700. The spelling Greenoak was found in two factory accounts dating back to 1717, and a legend developed of a green oak tree at the edge of the Clyde at William Street being used by fishermen to tie up their boats. This has been generally dismissed as imaginative folk etymology, but the image has frequently been used as an emblem or logo, carved on public buildings, used on banners and badges, and was once emblazoned on the local Co-operative Society emblem. The town's modern indoor shopping centre is called The Oak Mall and uses a green tree as its logo. The name is also recalled in a local song (The Green Oak Tree). Significantly, no green oak appears on the town's coat of arms which features the three chalices of the Shaw Stewarts, a sailing ship in full sail and two herring above the motto God Speed Greenock. Anecdotal evidence suggests that there was a 'Green Oak Tree', situated in Cathcart Square, at the top end of William Street, close to the Oak Mall – indeed, a horseshoe set into the cobblestones, between the 'Mid-Kirk' church and the central feature of the square, was where it once, supposedly, grew. Hugh de Grenock was created a Scottish Baron in 1296, and the seat of the feudal barony of Greenock was apparently what became Easter Greenock Castle. Around 1400 his successor Malcolm Galbraith died with no sons, and his estate was divided between his two daughters to become two baronies: the eldest inherited Easter Greenock and married a Crawfurd, while Wester Greenock went to the younger daughter who married Schaw of Sauchie. Around 1540 the adjoining barony of Finnart was passed to the Schaw family, extending their holdings westward to the boundary of Gourock, and in 1542 Sir John Schaw founded Wester Greenock castle. 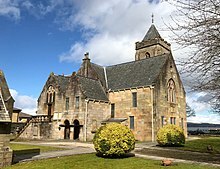 The Scottish Reformation of 1560 closed the chapels in the parish, and as the parish church was some 6 miles (9.7 km) distant at Inverkip over a difficult route which was impassable in winter, in 1589 John Schaw obtained a charter from King James VI to build a kirk for the "poor people upon his lands who were all fishers and of a reasonable number". Later known as the Old Kirk or the Old West Kirk, it was constructed on the west bank of the West Burn estuary and is reputed to have been the first Protestant church built in Scotland after the Reformation. The coast of Greenock formed a broad bay with three smaller indentations: the Bay of Quick was known as a safe anchorage as far back as 1164. To its east, a sandy bay ran eastwards from the Old Kirk and the West Burn as far as Wester Greenock castle. 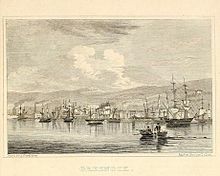 The fishing village of Greenock developed along this bay, and around 1635 Sir John Schaw had a jetty built into the bay which became known as Sir John's Bay. In that year he obtained a Charter raising Greenock to a Burgh of Barony with rights to a weekly market. Further east, Saint Laurence Bay curved round past the Crawfurd Barony of Easter Greenock to Garvel (or Gravel) Point. When a pier (or dyke) was built making the bay an important harbour, the fishing village of Cartsburn gained the alternative name of Crawfurdsdyke. In 1642 it was made into the Burgh of Barony of Crawfurdsdyke, and part of the ill-fated Darien Scheme set out from this pier in 1697. This town was later renamed Cartsdyke. The fishing trade grew prosperous, with barrels of salted herring exported widely, and shipping trade developed. As seagoing ships could not go further up the River Clyde, the Glasgow merchants including the Tobacco Lords wanted harbour access but were in disputes with Greenock over harbour dues and warehouses. They tried to buy the Garvel estate for a harbour when Easter Greenock lands were put up for sale to meet debts, but were outbid by Sir John Schaw who then got a Crown Charter of 1670 uniting Easter and Wester Greenock into the Burgh Barony of Greenock. A separate Barony of Cartsburn was created, the first baron being Thomas Craufurd. In 1668 the City of Glasgow got the lease of 13 acres (5.3 ha) of land upriver close to Newark Castle, and construction promptly started on Newport Glasgow harbour which by 1710 had the principal Clyde custom house. In 1696 and 1700 Schaw and residents of the town made unsuccessful bids to the Scottish Parliament for grants for a Greenock harbour, then when the Act of Union 1707 opened up trade to the Americas and the associated slave trade with West Africa, they raised their own funds. The work was completed in 1710, with quays extended out into Sir John's Bay to enclose the harbour. In 1711 the shipbuilding industry was founded when Scotts leased ground between the harbour and the West Burn to build fishing boats. Greenock rapidly became a major port and shipbuilding centre, and though tobacco imported from the colonies was taken to Glasgow by pack horse, the more bulky imports of sugar were processed locally. From 1774 the dredging of the River Clyde increasingly allowed ships to take merchandise directly to Glasgow, but merchants continued to use Greenock harbour. The American Revolutionary War temporarily interrupted trade, and the gun battery of Fort Beauclerc near the West Burn was extended to guard against the threat of privateers, but the emphasis shifted to wider markets including imports of rum and sugar from the Caribbean, wines from Spain, and fish from North America. A whaling business operated for about 40 years. In 1868, in what became a cause celebre, seven young Greenock males stowed away on a cargo ship bound for Quebec. Treated with what was, even for the times, exceptional brutality, they were forcibly disembarked in Newfoundland; by the time they were returned to Scotland, three of them had died. The Captain and mate of the cargo ship were tried in a blaze of publicity at the Sheriff's Court and served short gaol terms. In 1714 Greenock became a custom house port as a branch of Port Glasgow, and for a period this operated from rooms leased in Greenock. Receipts rose rapidly with the expansion of colonial trade, and in 1778 the custom house moved to new built premises at the West Quay of the harbour. By 1791 a new pier was constructed at the East Quay. In 1812 Europe's first steamboat service was introduced by PS Comet with frequent sailings between Glasgow, Greenock and Helensburgh, and as trade built up the pier became known as Steamboat Quay. The custom house needed larger premises, and in May 1817 the foundation stone was laid at the quay for a Custom House building designed by William Burn, which was completed in 1818. Its gracious neoclassical architecture features a Grecian Doric portico looking out over the quayside, which was given the name Customhouse Quay. In 1828 the Custom House was praised as "a grand National Structure" in "the highest style of elegance". By then there were scheduled steamboat sailings to Belfast, Londonderry, Liverpool, Inverness, Campbeltown, the Hebrides and "all the principal places in the Highlands". The Custom House underwent extensive refurbishment which was completed in 1989 and, until closure of the building in 2010, housed a customs and excise museum which was open to the public. In June 2008 HM Revenue and Customs (HMRC) announced that the building would close in 2011 as part of a rationalisation project with any jobs being transferred to offices in Glasgow, and despite a campaign to oppose these plans, the building closed in August 2010. Riverside Inverclyde arranged further refurbishment works, and in 2013 announced that space had already been let to companies including PG Paper Company Ltd and Toshiba which had planning permission to form meeting rooms and an executive office in the building. Greenock Telegraph estimated that £4.1 million has been spent over 5-year period for the renovation works. Greenock Central railway station at Cathcart Street opened in 1841, for the first time providing a fast route from Glasgow to the coast linking up with Clyde steamer services. The provision of this new line meant there was no need to take the steamer all the way down river from Glasgow. In 1869 the Caledonian Railway was bypassed by the rival Glasgow and South Western Railway which opened a station on the waterfront at Princes Pier, served by a tunnel under Greenock's west end. To regain custom, the Caledonian Railway extended (what is now known as the Inverclyde Line) the Glasgow, Paisley and Greenock Railway west to Gourock; this line was built to run inland through deep cuttings and tunnels, with a tunnel under the whole length of Newton Street crossing under the other railway tunnel to emerge near Fort Matilda railway station. Spoil from the cuttings and tunnels was used to build an embankment out from the shore to a long timber wharf at Gourock railway station, providing space for railway sidings. The railway bought Wester Greenock castle and its extension, the Mansion House, and demolished them before constructing the tunnel immediately west of Greenock Central station, running under the castle grounds which now form Well Park. View from above Cathcart Street over Cathcart Square to the Municipal Buildings, with the Victoria Tower to the right of "Cowan's Corner", and the Mid Kirk spire of 1781 to the left. 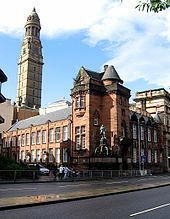 Greenock's increasing importance and wealth was manifested in the construction of the Italianate Municipal Buildings, whose Victoria Tower, completed in 1886, stands 245 feet (75 m) tall. Begun five years previously in a competition won by architects H & D Barclay, it exceeds the height of the tower of Glasgow City Chambers by more than a metre. The Municipal Buildings were bombed during World War 2 and what is known as Cowans Corner on the southern elevation of the building was destroyed beyond repair and remains like so today. Cowan's Corner is named so after the story of how an obstinate shop owner took on the town council and thwarted its plans for the construction of the Municipal Buildings. In the 1850s, the council started buying up all the property on the projected Municipal Building site, but the council did not anticipate it would run into problems when attempting to negotiate with a certain Robert Cowan, one of the owners of the firm of Cowan & Lawrie that operated a shop on a corner site in Cathcart Square. The council made every effort to reach a compromise but Robert refused to sell his property. 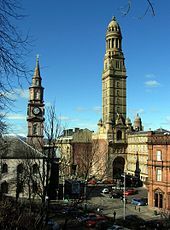 Only when the plans were altered, owing to the fact the corner site could not be acquired, was Greenock's famous landmark — the Victoria Tower — designed. Work started on the Municipal Buildings in 1881 and was completed in 1886. The total cost was £197,061 — a colossal amount then — and it left the town with a debt not finally cleared until 1952. After the buildings were finished, further legal proceedings started and a court decision meant Robert Cowan had to move. He opened new premises at the corner of Westburn Street and West Blackhall Street. The property at the corner of the square was destroyed during the Blitz of 1941. Despite Robert Cowan being forced out, it would appear the council could not proceed with any plans it had for the site prior to the Blitz. A 1957 Telegraph story stated that only a few years earlier had Greenock Corporation managed to negotiate its purchase due to conflicting claims by descendants of the original owners. The article said that it had been suggested the corporation might finally be able to complete the Municipal Buildings to approximately the original designs. Cowan's Corner remains vacant but is a landscaped area with seating. The War of 1812 reawakened fears of American raids against Britain's ports. Earlier gun batteries, had been dismantled, and in 1813 ground was granted for a battery at Whitefarland Point: Fort Matilda was completed in 1818, and was sporadically modified over the century. The land to the west of this was common ground for inhabitants of the town, but in 1907 the Admiralty compulsorily purchased part of this land for a torpedo factory. The remaining space was handed over to Greenock Corporation in 1914 as a public park. The Clyde Torpedo Factory, which opened in 1910, with 700 workers transferred from the Royal Arsenal, Woolwich. The site was tasked with designing and testing of torpedoes. These were then tested in Loch Long. During the Second World War the site switched entirely to manufacturing torpedoes. The original gun battery site was occupied by the Navy Buildings, the main offices, just to the east of the torpedo factory buildings. Following WW2, in 1947, the site became fully committed to R&D as the Torpedo Experimental Establishment (TEE). TEE was closed in 1959, when all torpedo research, development and design were concentrated at the newly formed Admiralty Underwater Weapons Establishment (AUWE), Portland. The Old West Kirk features a scale model of a 20-gun frigate above its Sailor's loft: the Laird's Gallery is on the right. 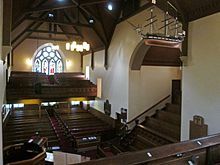 A church which became known as the Old West Kirk had been established in Greenock in 1591 under the patronage of John Schaw, the first built in Scotland since the Reformation. It was extended over the years, at an early stage the Schaw aisle provided pews for the Laird of the Barony, built as a gallery to the east of the nave of the church. Opposite it, above the front entrance, is the Crawfurdsburn or Choir Gallery. At the south end of the nave, the Sailor's Loft gallery was built in 1698, and features a 19th-century model frigate, which replaced earlier models. At the north end, the Farmer's Gallery is above the main seating area. A tower was added in the mid 19th century. In 1926, to make way for expansion of the Harland & Wolff shipyard (the present-day location of Container Way), the Old West Kirk was relocated to a new site on the Esplanade where it still stands. The shipbuilders provided the Pirrie Hall to the south of the site: this was opened in February 1925, just after the old church closed for work to commence, and was used during the works to accommodate services, enabling the congregation to see progress on the rebuilt kirk. It then came into use as the church hall. The church is notable for stained glass by artists such as Dante Gabriel Rossetti and Sir Edward Burne-Jones. The Church has a website. Greenock suffered badly during the Second World War and its anchorage at the Tail of the Bank became the base for the Home Fleet as well as the main assembly point for Atlantic convoys. On 30 April 1940 the French Vauquelin class destroyer Maillé Brézé blew up off Greenock with heavy loss of life following an accident involving two of her own torpedoes. Although this disaster occurred before the Free French Naval Forces were established, many people tend to regard the Cross of Lorraine on Lyle Hill as a memorial to the loss of the Maillé Brézé as well as to the later losses of the Free French Naval Forces which sailed from the town. On the nights of 6 May and 7 May 1941 around 300 Luftwaffe aircraft attacked the town in the Greenock Blitz. The original blank brick of Cowans Corner was covered in 2008 as part of the continuing work to improve the look of the town centre. Greenock thrived in the post-war years but as the heavy industries declined in the 1970s and 1980s unemployment became a major problem, and it has only been in the last ten years with reinvestment and the redevelopment of large sections of the town that the local economy has started to revive. 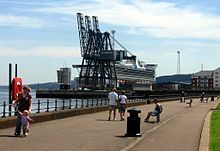 Tourism has appeared as an unexpected bonus with the development of the Clydeport Container Terminal as an Ocean Terminal for cruise ships crossing the Atlantic. Students who do not travel further afield for study often attend the Greenock campus of West College (formerly known as James Watt College of Further and Higher Education). Until 1974, Greenock was a parliamentary burgh in its own right. It was merged with Port Glasgow to form Greenock and Port Glasgow constituency. In 1997, it became Greenock and Inverclyde. After the redistribution of Scottish seats, it was merged into an enlarged Inverclyde constituency – the first time in political history that Greenock has not been named in a parliamentary seat. Greenock and Inverclyde remains a Scottish Parliament constituency. Langhill Clinic situated behind Inverclyde Royal Hospital is now the main psychiatric hospital with an IPCU unit and Day hospital alongside the main psychiatric ward. Arran View, Bogston, Bow Farm, Braeside, Branchton, Bridgend, Broomhill, Cartsburn, Cornhaddock, Fancy Farm, Fort Matilda, Gibshill, Greenock West, Grieve Hill, Hole Farm, Larkfield, Lyle Hill, Lynedoch, Overton, Pennyfern, Strone, Strone Farm and Whinhill. Spango Valley is located to the west of the town. Historically, the town relied on shipbuilding, sugar refining and wool manufacturing for employment, but none of these industries are today part of Greenock's economy. More recently the town relied heavily on electronics manufacture. However, this has given way mostly to call centre business, insurance, banking and shipping export. The Fleming and Reid merino wool mill employed 500 people – mostly women and produced wool garments spun and woven at the mill. This mill was at the corner of Drumfrochar Road and Mill Road. As of October 2012 Greenock has an unemployment rate of 5.3%, above the Scottish average of 3.9% (figure is for the Scottish Parliament constituency and includes Gourock, Inverkip, Port Glasgow and Wemyss Bay). The Inchgreen Drydock lacked major repair work for almost a decade, then in March 2013 it was used for urgent repairs to the ro-ro Stena Line ferry Finnarrow. View looking north over the Inchgreen Drydock and repair quay, with the Greenock Great Harbour to the left, after the announcement that the dry dock cranes are to be demolished. In the early 17th century, the first pier was built in Greenock. Shipbuilding was already an important employer by this time. The first proper harbour was constructed in 1710 and the first well-known shipbuilders, Scotts Shipbuilding and Engineering Company, was established the following year. It was the oldest shipbuilding business in the world and gained numerous contracts with the Royal Navy from 1806, building ships such as Glasgow. In 1967 Scott's was merged with Lithgows (founded 1874, later the largest privately owned yard in the world) the same year becoming Scott Lithgow, which was later nationalised as part of British Shipbuilders in 1977. From 1800 to 1980 many thousands of people worked to design, build and repair ships. The reduction in shipbuilding in the 1970s and 1980s meant that none of these companies are still trading. Greenock Shipbuilders included: Scotts, Browns, William Lithgows, Fergusons, Head the Boat Builder (lifeboats). Other marine engineering related companies included engine-makers – Kincaids, Scotts, Rankin and Blackmore (which included the Eagle Foundry) – ship repair (Lamonts) and Hasties for steering gear. Yacht builders included Adams and McLean (at Cardwell Bay). Other yards included Cartsburn, Cartsdyke, and Klondyke – all of which closed during the 1970s and 1980s due to competition from South Korea and Japan. Part of the site of the Scott's yard, is now an EE call centre, and the Kingston Yard was redeveloped for housing. Shipbuilding is now continued at Ferguson Marine Engineering in nearby Port Glasgow, after Ferguson Shipbuilders was taken over by Jim McColl and began modernisation. Ship repair work continues at the Garvel Drydock in Greenock's Great Harbour. The Inchgreen Drydock was opened in 1964 as one of the largest in the world at 305 m long and 48 m wide. It was used to re-fit the RMS Queen Elizabeth, and to fit-out the QE2. In 1966 it came under the nationalised Clydeport, which was privatised in 1982 and in 2003 was sold to Peel Ports of The Peel Group. They subsequently operated the drydock as part of their Cammell Laird shipbuilding subsidiary. Peel Ports put the drydock on the market for a lease in 2014, and Jim McColl opened discussions on leasing the dock to expand Fergusons' shipbuilding, but nothing came of the negotiations. 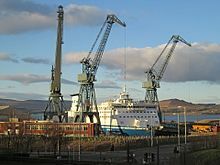 On 1 May 2017 Clydeport stated that the drydock cranes are to be demolished. Freight traffic is handled at the container cranes of Greenock's Ocean Terminal, at Prince's Pier which was constructed for the Glasgow and South Western Railway. The same terminal is a regular port of call for cruise liners visiting the west of Scotland. Greenock was a regular port of call for Cunard Line and Canadian Pacific in the 1950s and 1960s. Ships on the Montreal to Liverpool transit would anchor at the Tail of the Bank off Greenock in the Firth of Clyde and steam paddlewheel ferries would service the liners. Cunard operated the RMS Ivernia (1954), RMS Saxonia (1955), RMS Carinthia (1956) and RMS Sylvania (1957). These four ships were built at John Brown & Company shipyards, typically 22,000 tons, twin screw, 600 passengers. CP operated the Empress of Britain (1956), Empress of Canada and Empress of England. Greenock's Great Harbour is one of the three main ports providing marine services support to the Royal Navy, in dual site operation with Faslane at HMNB Clyde on the Gare Loch. 240 staff of the former Royal Maritime Auxiliary Service were transferred to Serco Denholm under a 15-year £1bn PFI contract awarded in December 2007. This facility means that "Admiralty" boats and tugs are a common sight on the Clyde. Greenock's attractive esplanade provides a gently curving riverside walk just over a mile (1.6 km) long extending to the west from Ocean Terminal to the Royal West of Scotland Amateur Boat Club sailing, kayaking and rowing facilities, which originated as a rowing club built against the east wall of Fort Matilda in 1866, and was granted its present title in 1885. The present clubhouse dates from 1878, and was subsequently extended. Fort Matilda was adapted for various purposes, eventually becoming the Navy Buildings which housed a main Her Majesty's Coastguard centre until it closed in December 2012, as well as a Royal Naval Reserve establishment, HMS Dalriada. The buildings have now been demolished, as a site for blocks of flats off Eldon Street. Sugar refining began in Greenock in 1765. John Walker began a sugar refinery in Greenock in 1850 followed by the prominent local cooper and shipowner Abram Lyle who, with four partners, purchased the Glebe Sugar Refinery in 1865. Another 12 refineries were active at one point. The most successful of these was Tate & Lyle. It was formed from a merger in 1921 between Abram Lyle, who had expanded into Plaistow, and Henry Tate, who had set up a sugar refinery in Liverpool and had expanded into London. The James Watt Dock, opened in 1886, provided shipping and shipbuilding facilities including a large warehouse (known as the Sugar Shed) which was used for both imported raw sugar, and refined sugar ready for delivery. By the end of the 19th century, around 400 ships a year were transporting sugar from Caribbean holdings to Greenock for processing. There were 14 sugar refineries, including The Westburn, Walkers, The Glebe, Lochore and Ferguson and Dempster, plus a sugar beet factory on Ingleston Street. Tobacco from the Americas also arrived here. When Tate and Lyle finally closed its Greenock refinery in 1997 it brought to an end the town's 150-year-old connections with sugar manufacture. A newly built sugar warehouse continued shipping operations at Greenock's Ocean Terminal. The former sugar warehouse at the James Watt Dock was by then scheduled as a category A listed building as a fine example of early industrial architecture, with an unusual feature of a colonnade of cast iron columns forming a sheltered unloading area next to the quayside. This building has since lain empty, with various schemes being proposed for conversion and restoration. The photographs show the building still intact in February 2006, but a fire on the evening of 12 June 2006 caused severe damage to much of the building before being brought under control in the early hours of 13 June. The local council confirmed that parts of the building will have to be taken down to ensure public safety, but promised an investigation and emphasised the importance of this world heritage building. In 2007, approval was given to proposals for a major regeneration project. As of 2018, the building and adjacent area of the dock accommodated a marina. Since IBM arrived in the town in 1951, electronics and light manufacturing have, until recently, been the mainstay of local employment. Texas Instruments (Formerly National Semiconductor) has run a silicon wafer manufacturing plant in the town since 1970. However, with manufacturing moving to Eastern Europe and Asia, work has shifted to the service sector, especially call centres. EE and IBM both have major call centre operations in Greenock, while the Royal Bank of Scotland Mortgage Centre processes Mortgage applications from throughout the UK & Ireland. IBM closed their entire factory in Greenock which is in the process of being demolished. Sanmina, another electronics company, took over much of the IBM installation but moved 370 jobs to Hungary in 2006. The Sanmina plant, which consisted of the former IBM AMDC (Automated Materials Distribution Centre) and Modules buildings 1 to 5, has since ceased operation and was demolished in 2009. The Spango Valley site was rebranded as "Valley Park" in late 2009. Lenovo has also re-located away from Greenock, and the plant is now at 10% of the 1999/2000 capacity. Greenock's main shopping thoroughfare was Hamilton Street, which connected West Blackhall Street in the west to Clyde Square in the east. In 1975 it disappeared along with several other streets as the area was pedestrianised as Hamilton Way. In the 1990s it was refurbished again, and The Oak Mall indoor shopping centre (in administration as of 21 November 2013) now forms the central feature of the town, and provides most of the major retail shops in Inverclyde, with approximately 85 units, with main anchor stores including Boots, Argos, The Body Shop, Clarks and New Look store. Marks and Spencer was in its original building (dating from 1936) which was simply built round during the first phase of pedestrianisation until the store moved to a new unit at a new retail park in Port Glasgow In addition, two major supermarkets Tesco and Morrisons are sited near the mall. A retail estate is located nearby, in front of the Waterfront swimming pool and leisure centre, and the streets around the mall provide a large number of smaller shops. Small groups of shops in most of the areas of the town provide for day-to-day needs, but most of the specialist shops are in the town centre. The town contains one diplomatic mission, an Italian consulate. Greenock is Scotland's best served town in terms of railway stations. It boasts eight: Bogston, Cartsdyke, Greenock Central, Greenock West, Fort Matilda, Whinhill, Drumfrochar and Branchton. Only Glasgow has a much greater number of stations and Edinburgh possesses only one more. Greenock has the longest bored railway tunnel in Scotland at 1.2 miles (1.9 km) in length. Located directly under Newton Street in the town, the tunnel allowed for the extension of the railway to Gourock. Greenock is served by a number of local bus routes covering the majority of Greenock, Gourock and Port Glasgow. Long distance services travel regularly to Glasgow, Largs and Dunoon. The majority of routes are run by McGill's Bus Services. The Largs to Glasgow corridor is served by three services, the 901, 906, which provide a bus along this route every 15 minutes for most of the day. Route 907 offers a service from Glasgow's Buchanan bus station to Dunoon via Renfrew road paisley, Port Glasgow and Greenock every 2 hours. The X7 service also offers travel from Greenock to Glasgow, serving the Slaemuir area of Port Glasgow before travelling through Kilmacolm, Bridge of Weir, Houston and Linwood, then joining the motorway to Braehead before heading into Glasgow City Centre. Greenock is located at the end of the A8 road/M8 motorway which begins in Edinburgh. It is also the northern terminus of Euroroute E05 which heads south through England, France and Spain, ending at the Spanish port and container terminal of Algeciras. Greenock is one of the settings for Alan Sharp's 1965 novel A Green Tree in Gedde. It is fictionalised as 'Gantock' by Robin Jenkins in his 1979 novel Fergus Lamont (The Gantocks are a rocky shoal in the Firth of Clyde nearby, just off Dunoon). Alasdair Gray's 1984 novel 1982, Janine is set in a Greenock hotel room. Matthew Fitt's cyberpunk novel But'n'Ben A-Go-Go features a submerged Greenock after the effects of global warming. Greenock has featured in the poetry of W.S. Graham (evoking his childhood) and Douglas Dunn. Greenock is home to the world's first Burns Club, The Mother Club, which was founded in 1801 by merchants born in Ayrshire, some of whom had known Robert Burns. They held the first Burns Supper on what they thought was his birthday on 29 January 1802, but in 1803 discovered from the Ayr parish records that the correct date was 25 January 1759. The Mclean Museum is the largest museum in the Inverclyde area, featuring exhibitions on James Watt and a collection of Ancient Egyptian artefacts. The Beacon Arts Centre, with the Gallery Suite and café / bistro looking out over the Custom House Quay waterfront and the Clyde. The Greenock Arts Guild's Beacon Arts Centre (replacing the former Arts Guild Theatre) opened in 2013 in a new building at Greenock's Custom House Quay. It provides a 500 seat theatre that hosts a regular programme of plays, concerts, musical events, comedians and other events and a Studio Theatre, as well as a multifunction Gallery Suite providing rehearsal and meeting rooms which combine for event or performance space, and a café / bistro, both with views over the Clyde. Greenock hosted the National Mòd in 1904 and 1925. The 1974 BBC Scotland adaptation of the Para Handy novels, entitled The Vital Spark, was filmed in Greenock. In 2012, Greenock became the setting for the BBC television drama Waterloo Road, after the series was relocated from Rochdale, Greater Manchester. 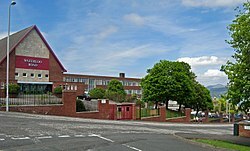 The series was shot at Greenock Academy, a former secondary school in the west of the town. Greenock has featured as the backdrop to several films: the television films Just a Boys' Game (1979), Down Where The Buffalo Go (1988) and Down Among the Big Boys (1993) and the cinema films Sweet Sixteen (2002) and Dear Frankie (2004). "Leaving" 1988 by Danny Boyle. In Rob Roy, which is set in the mid-eighteenth century, Greenock is referred to as "the new world". The engineer James Watt is the most renowned Greenockian. 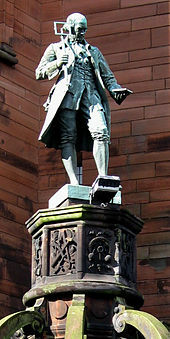 He is remembered in several placenames in the town, in the library instituted in his memory, and by the original Watt Memorial School (later College) building on the site of his birthplace in William Street, which incorporates a commemorative statue. The Finnart Campus of the local college was until 2014 known as the James Watt College. Wetherspoons opened the James Watt pub after the building was converted its previous use as the General Post Office. Other Greenockians include the composers Hamish MacCunn and William Wallace, violinist Henri Temianka, musicians John McGeoch and Thomas Leer, mathematician William Spence, poets Denis Devlin, W. S. Graham and Jean Adam, merchant Matthew Algie, actors Richard Wilson, Martin Compston and Stella Gonet, artists William Scott and Frederick Donald Blake, playwrights Bill Bryden, Neil Paterson and Peter McDougall, comedian Charles 'Chic' Murray, opera singer Hugh Enes Blackmore, broadcaster Jimmy Mack, American football player Lawrence Tynes, PGA Pro golfer Colin Robinson, Antarctic explorer Henry Robertson 'Birdie' Bowers and portrait painter Leonard Boden. Two Greenockians, Alexander Bruce and Theophilus S. Marshall, were involved in the drafting of the laws for Australian Rules Football. Pirate William Kidd claimed on death row that he was born in Greenock, but subsequent evidence has shown that he was born either in Belfast or Dundee. Robert Burns' lover Mary Campbell (Highland Mary) and her father sailed from Campbeltown to visit her brother in Greenock early in October 1786. Her brother fell ill with typhus, which she caught while nursing him. She died of typhus on 20 or 21 October 1786, and was buried in the Old West Kirk graveyard. In 1842 increasing interest in their romance led to a monument being erected by public subscription to mark the grave. In 1920 when the church site was needed to expand Harland and Wolff's shipyard, the monument was moved to its present site in Greenock Cemetery, with her remains being transferred to a casket and re-interred with due ceremony. The church itself was moved and rebuilt in its current location at the west end of the Esplanade in 1926. Cemetery entrance from Inverkip Street, with plaque commemorating John Galt. The novelist John Galt, who founded Guelph, Ontario in 1827, lived in the town and based some of his work, most notably Annals of the Parish (1821), on Greenock and surrounding towns. He is buried in the Inverkip Street Cemetery. The mother of American comedian and writer Jay Leno, Catherine Muir, was born in Greenock and emigrated to the US as a child. The American actress Julianne Moore is the daughter of the late Anne Love, a former psychiatric social worker who emigrated from Greenock. The Rev William C. Hewitt (minister at Westburn Parish Church in Greenock), Moderator of the General Assembly of the Church of Scotland in 2009–2010, is the first serving minister at a church in Greenock to be appointed. Robert Wilson, the grandfather of Uncle Sam (Samuel Wilson) was born in Greenock. Abdelbaset al-Megrahi, the Libyan intelligence officer convicted of the Lockerbie Bombing was incarcerated at Greenock Prison from 2005 until his release on 20 August 2009. Dr Donald McIntyre FRSE (1891–1954) was born and raised in Greenock. Greenock Morton F.C. are the local senior football team who currently play in the Scottish Championship. Founded in 1874 as Morton F.C., they play their home matches at Cappielow. At lower levels of the game, Greenock Juniors F.C. play in the West of Scotland Football League. Greenock hosts a rugby union team, Greenock Wanderers RFC, founded in 1873. It is one of the oldest clubs in Scotland. The town was also the host of the first ever international women's football match, which was between Scotland and England; it was held at the Ravenscraig Sports Centre. Greenock's climate is temperate maritime having mainly cool summers but with relatively mild winters. Its location means that the heat retentive properties of seawater help keep winter temperatures higher. Additionally, the effect of the Gulf Stream on the Clyde helps Greenock's average temperature stay approximately one degree above that of eastern coastal towns on the same latitude. 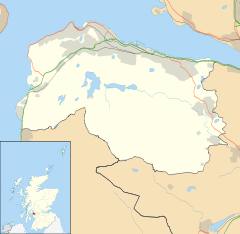 Indeed, Greenock's latitude (55.94 degrees north with a longitude of 4.75 degrees west) places it at the same latitude as the Moscow area. The warming effect of the Gulf Stream however, keeps the winter weather in Greenock much milder than that of Moscow. Greenock anecdotally has the reputation for having higher than average rainfall (the song The Green Oak Tree comments on this) but this is not statistically true; northwest of Fort William has the highest average rainfall in Scotland. Greenock's location gives long hours of daylight in midsummer with the opposite true in midwinter. On the longest day, 21 June, the sun rises at 04:31 and sets at 22:07. In midwinter, 21 December, the sun rises at 08:46 and sets at 15:44. Greenock's twin towns are Veulettes-sur-Mer and Cany-Barville, both in France. Another sister city is Coatesville, in Pennsylvania. ^ "Greenock (Inverclyde, Scotland, United Kingdom) - Population Statistics, Charts, Map, Location, Weather and Web Information". www.citypopulation.de. Retrieved 14 April 2019. ^ W. J. Watson, The History of the Celtic Place-Names of Scotland (Edinburgh, 1926), p. 201. ^ Watson, The History of the Celtic Place-Names of Scotland, p. 201. ^ a b Sweet, Andy. "Greenock Castle (site of) - Castle in Greenock, Renfrewshire". Stravaiging around Scotland. Retrieved 19 February 2018. ^ James, B. (2011). Popular Crime: Reflections on the Celebration of Violence. New York: Simon and Schuster. p. 51. ISBN 978-1-41655-274-1. ^ McDermott, S. (30 May 2018). "The Boys on the Ice". BBC News. BBC. Archived from the original on 25 June 2018. Retrieved 25 June 2018. ^ "Regeneration Projects Attracting Interest". Inverclyde Now. 16 November 2013. Archived from the original on 12 December 2013. Retrieved 10 December 2013. ^ "PG Paper moves to Greenock's Custom House". HeraldScotland. Retrieved 2017-02-06. ^ "£4m Greenock Custom House project nears an end". Greenock Telegraph. Retrieved 2017-02-06. ^ Montheith 2004, pp. 40, 47, 84, 70, 94..
^ Sphinx Fine Art; Edward Strachan; Roy Bolton (2008). Russia & Europe in the Nineteenth Century. Sphinx Fine Art. pp. 30–. ISBN 978-1-907200-02-1. ^ "Secret Scotland – Royal Naval Torpedo Factories". ^ "Welcome To The Old West Kirk,Greenock". Lyle Kirk. Retrieved 2016-09-15. ^ "Inverclyde Royal Hospital". NHS Greater Glasgow and Clyde. Retrieved 2010-05-07. ^ "Page 2" (PDF). Retrieved 2012-04-17. ^ "nomis – official labour market statistics". Nomisweb.co.uk. 30 September 2010. Retrieved 2013-01-26. ^ a b "End of an era as cranes set to be flattened at Inchgreen". Greenock Telegraph. 1 May 2017. Retrieved 11 May 2017. ^ "History". Peel Ports. Retrieved 11 May 2017. ^ "Inchgreen Drydock". Cammell Laird. 10 October 2015. Retrieved 11 May 2017. ^ "Revealed: billionaire scouts giant Greenock dry dock as potential shipyard". HeraldScotland. 18 September 2014. Retrieved 11 May 2017. ^ "Signing of Marine Services Contract". Serco Group plc. 14 December 2007. Archived from the original on 19 July 2011. Retrieved 7 May 2010. ^ Royal West of Scotland Amateur Boat Club Jubilee 1926 CS63-1-1, from "Local History Downloads". Inverclyde Council. 2016. Retrieved 20 February 2018. ^ "Online encyclopedia from Britannica 1911". ^ a b JWDAdministrator. "JWD History". James Watt Dock Marina, Greenock, Scotland. Archived from the original on 12 February 2018. Retrieved 11 February 2018. ^ "Greenock, James Watt Dock". Canmore. Retrieved 11 February 2018. ^ "Picture Gallery". Archived from the original on 26 October 2006. ^ "£180 million Regeneration Project Approved". Inverclyde Council. 7 January 2010. Archived from the original on 19 September 2013. Retrieved 20 February 2010. ^ "OAK MALL GREENOCK LIMITED ". Insolvent, Winding Up, Bankrupt & Administration Information. ^ "Congratulation Greenock Burns Club". The Robert Burns World Federation Limited. Archived from the original on 26 January 2010. Retrieved 18 January 2010. ^ "Homepage". The Beacon Arts Centre. 25 April 2013. Retrieved 20 February 2018. ^ "Waterloo Road relocates to Greenock". BBC News. 27 October 2011. ^ "Inverclydemedia.com". Archived from the original on 31 August 2009. Retrieved 10 November 2009. ^ Craik, A. D. D. (October 2013). "Polylogarithms, functional equations and more: The elusive essays of William Spence (1777–1815)". Historia Mathematica. 40 (4): 353–482. doi:10.1016/j.hm.2013.06.002. ^ "KIDD-L Archives – Subject: [KIDD-L] Captain William Kidd: recent biography". RootsWeb. Retrieved 2007-12-13. ^ "William Kidd 1645–1701". Archived from the original on 28 September 2007. Retrieved 2007-12-13. ^ "Highland Mary (Mary Campbell)". Famous Sons and Daughters of Greenock. Nostalgic Greenock. Archived from the original on 21 August 2008. Retrieved 2010-01-17. ^ "National Burns Collection – Design for a Monument proposed to be erected in memory of Highland Mary". Retrieved 2010-01-18. ^ "GMFC.net". Greenock Morton FC. Archived from the original on 8 June 2003. ^ "Greenockwanderers.co.uk". Greenock Wanderers RFC. Archived from the original on 28 August 2009. Retrieved 1 September 2009. ^ "Greenockcricketclub.com". Greenock Cricket Club. ^ "Greenockgolfclub.co.uk". Greenock Golf Club. ^ "Northern Scotland: climate". Met Office. Archived from the original on 13 August 2011. Retrieved 7 May 2010. Wikisource has the text of The New Student's Reference Work article "Greenock".